Chad Persons has Operated his Pro rig for the last 4 seasons of "The West Wing" with either one of his 3 TRANSVIDEO monitors: The 5" RainbowII (pictured here with Anton-Bauer battery back and Frameline Generator in a custom slide-in drawer), the 6.5" 16/9 Rainbow and his more recent acquisition: the 6" CinemonitorIIIa SuperBright. "In considering any professional product I have always given as much weight to the service and support as I do the product itself. In the case of TRANSVIDEO I have found that their products are fantastic and their service is second to no one. 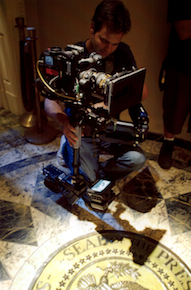 In addition, Marianne and Noel’s help with custom adaptions for Steadicam has made them invaluable to me." Chad Persons, on the set of "The West Wing"